World Taliban names 14-member negotiating team ahead of new talks with U.S. 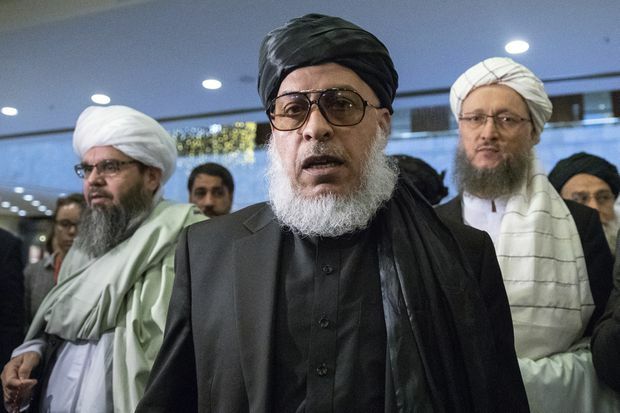 In this Feb. 6, 2019, file photo, Taliban Mullah Abbas Stanikzai, center, attends 'intra-Afghan' talks in Moscow, Russia. The Taliban on Tuesday announced a 14-member negotiating team ahead of talks this month with U.S. envoy Zalmay Khalilzad, who has been meeting with the insurgents to try to end America’s longest war. The Taliban have demanded Haqqani’s release since talks began last year. By naming him to the negotiating team, the Haqqani network might be indicating that his release is a precondition for their participation. Afghan President Ashraf Ghani has complained bitterly about being sidelined, and it’s not clear that his government would be willing to release Haqqani without being granted a larger role in the process. The U.S. envoy met Monday with NATO and European Union officials in Brussels, and tweeted that he was “encouraged by their strong endorsement on the progress we’ve made on a peace process.” He said the sides are aiming to reach a peace deal “worthy of the sacrifices made over decades of war,” and not a withdrawal agreement. This was Khalilzad’s first stop on a three-week mission that will also take him to Germany, Turkey, Qatar, Afghanistan and Pakistan.